I survived! seems like an odd way to describe the end of the holiday season but right after December 25th, it seemed as though we and the house had just gone through war with Christmas. Bryan's sworn enemy - glitter - was scattered all over the hardwoods and wrapping paper and packaging boxes overfilled the garbage. We celebrated both Christmas Eve and Christmas Day at our new house with family and grabbed this gem of a picture on Christmas morning. 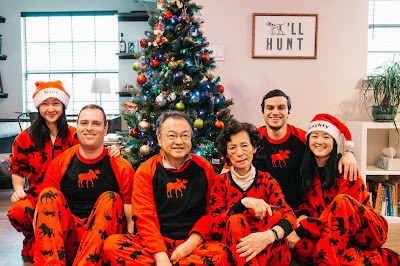 I am 100% doing Christmas pajamas as a new annual tradition. The undisputed winner of Christmas was Bowie. He did NOT have to wear Christmas pajamas and still made out like a bandit with the treats and toys coming from all of our friends and family. 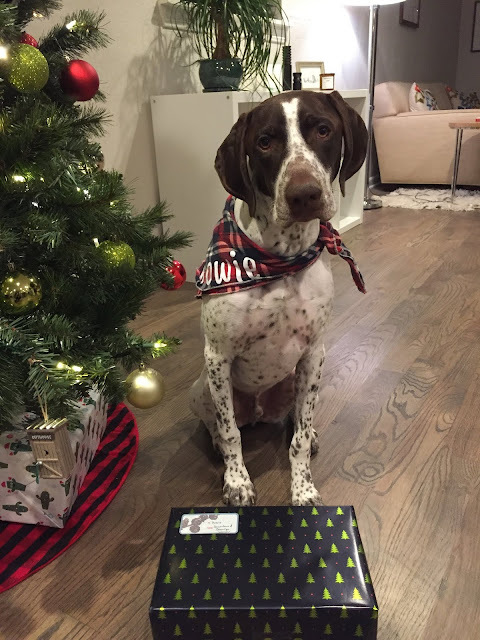 He also made the "front cover" of our Christmas card with this face, which received lots of laughs from friends and family after they received the card. 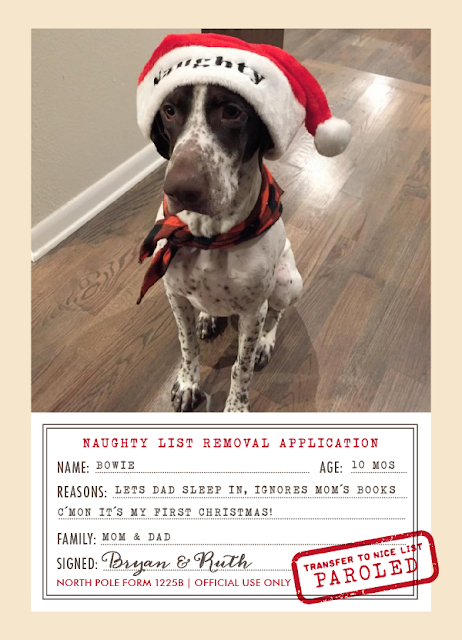 We'll have to figure out some way to top it next year, although I have a sneaking suspicion that he'll still be naughty in 2019. As 2018 was a rough "work" year, I spent the last two weeks of December focused on getting a lot of rest, catching up on reading, and staying very warm. I ate more than my fair share of cheese and we hosted a birthday / housewarming / ugly sweater combination party. I made my first signature cocktail for the occasion - this bourbon, orange and ginger smash hit from Food52. A useful tip for big parties: when trying to feed everyone, order food instead of making it. We had pizzas delivered for the ugly sweater party from a local pizzeria and everyone loved them, especially the vegetarian one! It allowed us to focus on the guests instead of rushing around making sure food was hot and put out at appropriate intervals. Couple that with disposable plates and utensils make for very easy clean up as well. Even though we did order food a few times, there was still boat loads of holiday cooking. Maybe even more than over Thanksgiving as we had to make up for Siri and her fiance missing it all. We smoked ribs and baked a vegetarian moussaka (recipe from Epicurious) for Christmas Eve that took a little bit longer to prep but was worth it. The eggplant, which is the meat stand-in, is sweated, baked alone, and then baked within the moussaka so the end result is a non-soggy dish. On Christmas morning, my mom brought over pre-made xiaolongbao and vegetarian dumplings for brunch which were also a hit. Taking it easy was an absolutely idyllic way to spend two weeks and made me wish I had one every couple of months. Unfortunately now it's back to the regular scheduled programming. We were supposed to have a winter storm here in Texas to kick off the new year except we can't even do that right so it's just freezing cold rain right now. Despite that, I'm looking forward to 2019 and the fun we'll have this year. Cheers to 2019 and happy new year y'all! That is one epic Christmas picture. We don't do dress ups quite like the Americans do over here, but I'm always envious of them. I have heaps of family in New England and they're always posting cordinating outfits for particular holidays. Also the personalised Christmas cards. I wish that was something we also adopted more of in Australia as opposed to generic cards and greetings. Praying that rain is gone by the time I get back tomorrow! I'm glad that you had a good 2 weeks! It's actually sunny today! Safe travels! Sounds like you had a great Christmas/New Year, Ruth:) YAY! Love that family pic. Your mom is looking great:) And Bowie..yeah...I can totally see why he stole the show. Teehee. Here's to a great year ahead of us. My family doesn't all do the matching pj thing but my mom and a group of aunts do. They are all gingerbread/baking themed because we do a gingerbread baking weekend every year. It's definitely goofy but connecting. I'm glad you survived the holiday war. It was a tough fought battle over here but I'm glad to be back home. That is an absolutely adorable family Christmas photo! You survived! I can understand that feeling about the holidays! Your christmas card is awesome - and pizza is always a winner - last year my mom served pizza at our annual family christmas party and it was a total hit. Happy New Year! It's a perfect party food - I might make it an annual tradition :) Happy new year! I love matching pajamas!! If I tried to do that with my family now, my little brother would revolt. Some people are such party poopers! It's so worth it! And they're actually pretty comfy. Bowie is adorbs. I love him. Ahhhh! That card is too cute!